Capital fundraising is a useful process to pursue where an organisation is aiming to raise funds for a specific capital item, such as acquiring land, constructing, purchasing and/or modifying a building or purchasing a significant asset such as a vehicle or equipment. Unlike normal operational fundraising, capital fundraising usually looks to recruit a comparatively modest number of people to contribute an extra-ordinary amount towards a specific project. A capital campaign has a beginning, middle and end. In a capital campaign, the amount needed to be raised should fairly accurately be known. That allows for a programme to be developed for the raising of that nominated amount. Where a campaign is going to cost a significant amount it can be cost effective to have a fundraising feasibility study undertaken. This is a fundraising specialty with numerous consultancies available in the market-place to conduct such a study. A fundraising feasibility study will tell you literally whether or not it is ‘feasible’ to raise the money you are seeking and under what circumstances this might be achieved. At worst, a study can help you avoid plunging head-long into a campaign that fails to achieve its target by informing you of pre-campaign work that might need to be completed before a campaign might succeed. If the top 100 gifts contributed to the campaign is equal to or greater than two thirds of the total, chances are that the campaign will succeed. Another element of capital campaigns is that donors can be offered the opportunity to pledge their gift in instalments – usually over a three year period. That allows donors to stretch the level of their gift without over-stretching their cashflow. Gifts to capital campaigns are also often made from a donor’s capital rather than from their earnings. It is rare for donors to renege without sound reason. 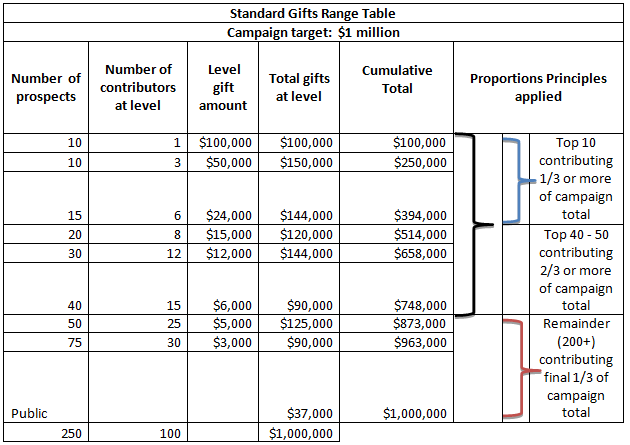 The way capital fundraising campaigns are managed by specialists in this line of work is via what’s called a gifts range table as shown below. The gifts range table provides a disciplined approach to determining what levels of gifts will be required to achieve success. It doesn’t mean that the table needs to be applied slavishly. However, a feasibility study provides a basis for testing out gift levels that might be secured from potential contributors. It can then be amended to provide a more realistic picture. One other important factor remains. The campaign shouldn’t go ‘public’ until two thirds or more of the required pledges have been secured. That way, embarrassment can be avoided. If the campaign is launched too early, a donor might self-select at a gift level they assume will be significant. It is then nigh impossible to go back to the donor and ask if they would consider giving at a higher level. It is not surprising then that the most time for a capital fundraising campaign is spent in preparation. Prospects need to be identified and potential contribution levels determined for each. Those prospects need to be approached and asked if they will consider giving at the level pre-determined through research. They may not agree or be able to contribute at the nominated level. But, asking for a gift at a pre-determined level gives the donor opportunity to consider their contribution in the light of the amount being requested. Original generation time 1.4929 seconds. Cache Loaded in: 0.0004 seconds.